In his pioneering article on the place-names of North Wicklow and South Dublin mentioned in the tale Togail Bruidne Da Derga (JRSAI lxv, 1935), Eoin Mac Néill had some difficulty with the name Ó Cualann, for which he suggested the meaning 'sheep of Cualu' , due to some imagined resemblance. However, although this meaning is known in Old Irish, there is good reason to believe that ó here is a hill-name element, simply meaning 'lump'. It is rare, but is found in Gleann Ó (Glenoe, Co. Antrim [DUPN]) and in Mullach an Ó (East Mayo). For the English name Sugarloaf, For origin of name, see Sugarloaf Hill in the Knockmealdowns. 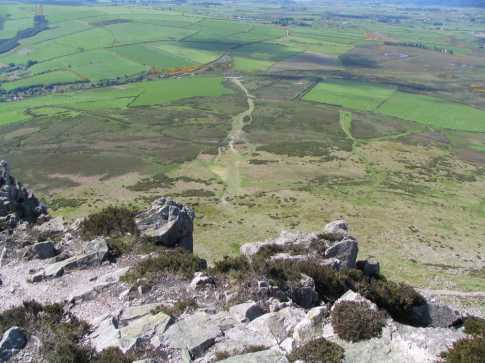 Great Sugar Loaf is the 566th highest place in Ireland.